In the next step towards building a hyperlink tunnel in Southern California, Elon Musk's Boring Company is ready to build an underground garage in the Hawthorne area. Elon Musk’s Boring Company is all set to build an underground garage that will be connected to its hyperloop tunnel. The Hawthorne City Council in Southern California has granted Elon Musk’s Boring Company the go signal to build an underground garage. According to reports, the company’s futuristic garage was approved after the city officials have been assured that security and noise-control measures will be in place. 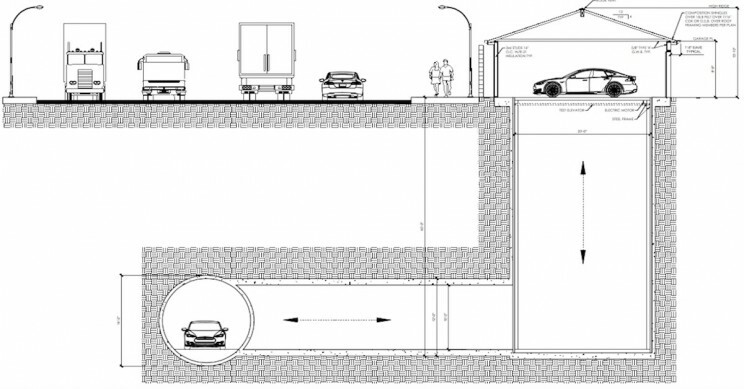 The new plan includes an elevator capable of lifting cars on street level or lowering them to the underground garage which will be connected to Musk’s Hyperloop tunnel. The resolution for the infrastructure’s construction was passed last Tuesday night. At the moment, The Boring Company’s 2-mile testing tunnel in Hawthorne is almost complete. The construction of the underground garage and elevator appears to be a part of the company’s phase 2 testing which will involve direct access from a private residence to the future underground electric pod system situated between Hawthorne Boulevard and Prairie Avenue. If all goes as planned, these home will have the first ever garage connected to the Hyperloop tunnel. As part of the security procedure, the test elevator that will be built for the underground garage will not be made accessible to the public. Cars will not also be allowed to move in and out of the garage from the street. Once the Hyperloop tunnel is done, all vehicles will have to enter the garage and the tunnel through the SpaceX campus. This procedure will be put in place to ensure that the city’s traffic situation will not be affected. After the resolution was passed, more than 100 residents have been notified of the impending construction and were assured that the company’s work will have minimal to zero impact to the community’s noise level. All security measures within the construction area will be shouldered by The Boring Company. However, the security plans would still go through the review of the Hawthorne police and fire department. What can you say about this latest development in the futuristic Hyperloop tunnel plans of The Boring Company?